Calum Fyfe posted a pair of 67s. Internationalists Sandy Scott and Calum Fyfe led the qualifiers at the new-look Scottish Men’s Amateur Championship in Prestwick. 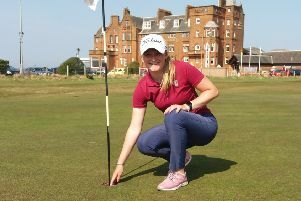 The pair posted fine 36-hole totals of eight under par over Prestwick and Prestwick St Cuthbert’s to comfortably finish clear at the top of the 264-player field in Ayrshire. The top 64 players and ties booked their spots in the matchplay stages, as the event takes on a new format this year falling in line with other national bodies. “One of the goals for the week was to try to win the strokeplay,” said Cawder’s Fyfe, who posted a pair of 67s, before being joined at the summit in the early evening by Scott (66, 68). Nairn’s Scott was joined by other north-based players high on the strokeplay leaderboard, with Rory Franssen (Inverness) and Sam Locke (Banchory) finishing on two under. Late in the day, as a glorious sun sparkled across the Prestwick links, Ed Wood (Crow Wood) and Anglo-Scot Ryan Lumsden from Royal Wimbledon reached three-under-par to share third spot. Other fancied players such as the Howie brothers from Peebles, Darren and Craig, also progressed, as did Kirkhill’s Craig Ross, Matthew Clark (Kilmacolm), Christopher Maclean (Balmore) and Turnhouse’s Euan McIntosh. The cut mark fell at seven over, with last year’s champion from Windyhill, George Duncan, among those to miss out on eight over. On the pro front, Caldwell’s Chris Currie stormed to the top of the leaderboard on the first day of the Deer Park Masters, with an impressive six-under-par 66 giving him a one-shot advantage. Currie made the most of his early start and quickly posted a target for others to chase with Bishopbriggs’ Robert Arnott, Grantown-on-Spey’s Gavin Hay and Braid Hills’ Paul McKechnie the only ones to come close, sitting one shot back at the halfway point in the event. Reigning champion Greig Hutcheon finds himself in a tie for fifth place after heading straight to Deer Park from a meet up with the Great Britain and Ireland PGA Cup team in Surrey at the weekend. His two-under-par round of 70 leaves him with work to do on day two to catch Currie and keep his hopes of a fifth consecutive Deer Park Masters title alive.